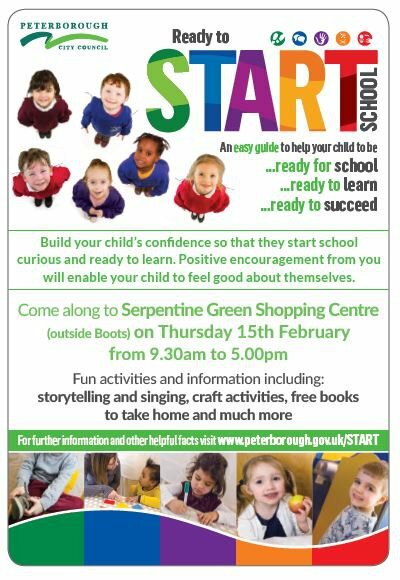 Families at Serpentine Green Shopping Centre will have the chance to enjoy fun activities and take home free books on Thursday 15 February, as part of a school readiness drive across the city. Peterborough City Council and the National Literacy Trust are working with a variety of partners across Peterborough to ensure that all children in the city are ready to start school. The event follows the successful launch of the START school readiness leaflets for parents and carers at Queensgate Shopping Centre last Easter. Each child will also receive a free book to inspire story time at home. A range of partners will be on hand to give parents advice about the transition process into school. There will also be information on offer about the 30 hour offer for childcare. A huge thanks to Serpentine Green for hosting the event. Partners include: Early Years and School Standards and Effectiveness teams from Peterborough City Council, National Literacy Trust, Vivacity, Barnardo’s Children’s Centre, Peterborough City College, Spurgeons Children’s Centre, Public Health, Family Action, Dogsthorpe Primary School, Brewster Maintained Nursery, Lamphouse Theatre and Eastern Angles.